This smartcard adapter follow exactly the specification ISO 7816. Also, the protocol is the “asynchronous half duplex T=0 protocol” with “active low reset” and “inverse convention” as defined in this standard. The following description may be used in order to connect computers toISO 7816 compatible chip card systems (e.g. GSM mobile phones or other pay-TV decoding systems) if they also use asynchronous transmission. For smart card systems which use synchronous transmission (e.g. most phone cards) the interface described here will need some modifications. According to ISO, a chip card is 85.60 mm long, 53.98 mm high, 0.76 mm thick and the edges are rounded with a radius of 3.18 mm. It has eight defined contact areas (C1 - C8 in the diagram below), each of which is at least 2 mm wide and 1.7 mm heigh. You can produce your card adapter by making a PCB with contact areas at the above listed locations. The PCB must have precisely the thickness and width of a real card, but it may be longer, so that you can locate the interface electronics on the part which remains outside the slot. Normal PCBs are about 1.3 mm think and won’t fit into the slot. Either you get a PCB which is about 0.8 mm thick or you make it thinner, e.g. by using a sander machine. The adapter will only need the card contacts I/O, GND, RST and VCC. The pins DTR, DSR and CTS are not actually needed, they are just connected together in the adapter, so that defined levels are available on them because some software might need this. Download large pictures (1200 x 1200 DPI). The MAX232 converts the RS-232 levels (about +10 and -10 V) to TTL voltage (0 and +5 V) and vice versa without requiring anything else than +5 V power supply. This chip contains two TTL->RS-232 and two RS-232->TTL drivers and needs four external 1 uF capacitors in order to generate the RS-232 voltage internally. The adapter electronic gets its power supply from the smartcard reader device VCC line or you can use an external 5 V supply if you wish. The card slot’s RST line is connected using one of the TTL->RS-232 drivers in the MAX232 to DCD, so that the software and the reader can easily resynchronize in case of a protocol error. The I/O line is a bidirectional half-duplex asynchronous TTL level serial port. We can connect this line to a MAX232 TTL input driver (which is connected to RxD and sends bytes to the PC) in order to receive data from the reader. The TxD signal is converted in the MAX232 to TTL level and is connected with an open collector TTL driver to I/O. This open collector driver (one of six in the 74LS07) has a high impedance output during idle state and 1 and is connected to GND during a 0 on it’s input. As there is already a pull-up resistor to +5 V on I/O in the smartcard reader device, this circuitry guarantees, that the adapter is in high impedance state if the TxD line is idle and delivers the correct voltage if the PC sends bytes and the smartcard reader device is in reception mode. As we don’t connect totem-pole or tristate outputs to I/O, a short circuit should be impossible in the adapter. Pay attention to the polarity of the capacitors (marked with a + in the diagram next to each capacitor)! The –>– symbols in the MAX232 diagram above indicate the voltage converters inside the chip. The RED LED show you when the reader activates the interface. The GREEN LED show you the I/O traffic. The capacitor between VCC and GND is not absolutely necessary but recommended. As a side effect of this simple interface design, every byte sent by the PC is at the same time also received by the PC. Consequently, you can test the circuit with a terminal emulator and external +5 V supply by switching of local echo: if you still see every typed character immediately on the screen, the interface should be all right. Software must be capable of dealing with this echo from the interface. As specified in the ISO standard, the reader activates VCC only shortly before a reset and deactivates VCC again if an answer-to-reset packet isn’t received from the card in time after the reset signal. If you have a larger distance between the PC an the smartcard reader device, then locate the adapter electronic near the reader, because the RS-232 interface is much more suitable for long cables than the TTL signals. Cables of 12 m length have sucessfully been used and you shouldn’t have problems with RS-232 cables up to 25 m length and more. You can also use this adapter circuit to allow a PC to listen to the data traffic between a reader and a real card. Just connect the real card and the adapter parallel to the reader and don’t let the PC software transmit anything. For more details about the protocol, check 7816-3] standard. There are many alternative ways to build this interface if you don’t have some of the components available. E.g. the MAX232 could be replaced by the fully compatible LT1081 from Linear Technology. The circuit still works fine if you use higher capacitors than 1 uF (e.g. my prototype worked fine with 4 22 uF types which were left from a previous project), but use equally sized capacitors. 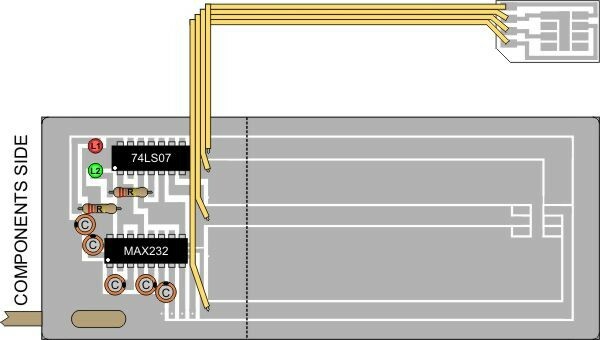 If you use the pin compatible MAX220 (a low power version) instead of the MAX232, then use capacitors with 10 uF or higher. The MAX232 should be the easiest available one of these chips. If you don’t have the experience to etch your own PCB (it’s not very difficult) or don’t know someone who does, then you could solder the components in a universal raster PCB or plug them into an experimental board. Then produce just a simple PCB with only the ISO card contacts and connections to outside the smartcard reader device by mechanically removing the thin copper layer with a good knive between the 4 contacts and lines. Peoples have also suggested to use an empty German phone card, which also has ISO contacts. Remove the integrated chip from the other non-contact side, test whether the contacts are now isolated from each other and use a special conductive ink you’ll find in an electronics store in order to draw connections to the end of the card were you connect wires. I haven’t tested this and don’t know how well it works, but you might also consider it. Normally, both the RS-232 interface and the smartcard reader device slot should not be harmed by short circuits, but be careful. Also try to avoid electrostatic voltage (e.g. generated by walking on a suitable carpet) near the interface, because discharges cause easily reader or PC crashes and could theoretically even harm the hardware (especially CMOS chips like the 74HC04). Before connecting the reader and the PC the first time, you might want to check the voltage between the two GND lines. In correct installations, the difference of the GND potentials is very low (below 1 V), but someone has reported up to 50 V (high impedance only). Most smartcard reader devices are not connected with the earth line, so their GND potential is floating or sometimes only defined by e.g. the shielding of the antenna cable. If your antenna system is not correctly installed, the shield might also not be grounded. One quick solution might be to switch off all components and then connect first the RS-232 GND line to the GND of your smartcard reader device before connecting anything else. You might also design the ISO contacts on the PCB so that GND touches all pins at first when the PCB is inserted in the card slot. The only really secure protection between your PC and your smartcard reader device would be to use an isolating RS-232 driver (e.g. you might want to check data sheets of Maxim’s MAX250/251/252 chips which offer RS-232 protection up to 1500 V), but under normal circumstances you won’t need this.